Clubs renewing by November 1 will be entered into our Club Membership Renewal Drawing. Shoots registered by November 30 will be listed in the February issue of Clay Target Nation magazine. 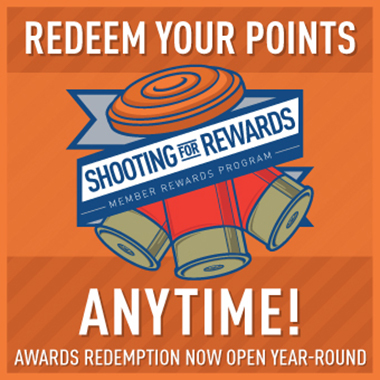 Complete an NSCA Registered Shoot Application and submit it to your state association for approval. The association will submit approved shoots to NSCA. ONLINE: Go to NSCA Club Renewal Form. You can do the entire renewal process, including payment, by following the instructions there. Update all club contact and other information. BY MAIL: If you prefer to renew by mail, go to the NSCA Club Renewal Form, update your club information page, then print it rather than submitting online. (Right-click, then select print.) This is a fillable form, so you can complete it online before printing. Mail it with your $100 dues to Lori Hartmann, NSCA, 5931 Roft Rd., San Antonio, TX 78253. BY PHONE: Call 1-800-877-5338 ext. 116. Please have your member club number and credit card handy. Also, review your club’s information on the NSCA Club Renewal Form and be prepared to provide any needed updates. ADDRESS CHANGES: Regardless of how you renew, please be sure to update all your contact information to ensure prompt and accurate delivery of your important club benefits. When you click the NSCA Club Renewal Form and enter your club member number, the information on file for your club will populate the form for updating. You may also provide it by phone at 1-800-877-5338 ext. 116. Download and complete the Registered Shoot Application form and send it to your State Association for shoot date approval. Your State Association will forward the shoot application form to headquarters when approved. (If you state does not have an association, submit shoot application to your National Delegate.) Be sure to designate any shoots with 200-299 participants in any one event in 2017 as a “Big Blast” and any with 300 or more participants in any one event in 2017 as a “Mega Blast” so they can be included in those sections in Clay Target Nation magazine and on our website. Approved shoot applications must be received at headquarters by November 30, 2017, for your shoots to be included in the February 2018 issue of Clay Target Nation. If you have any questions or need assistance, contact Lori Hartmann, Club Administrator, at 210-688-3371 ext. 116 or lhartmann@nssa-nsca.com, Monday-Friday 8:00 a.m. to 5:00 p.m. CST.